Born in Plovdiv, Christoff demonstrated early his singing talent and sang as a boy at the choir of the Alexander Nevsky Cathedral, Sofia. [ citation needed ] His father had been a very popular cantor at Resen, attracting the faithful to the Exarchist church where he was chanting. In the late 1930s he graduated in law and started a career as a magistrate. He continued singing in his spare time in the Gusla Chorus in Sofia, achieving an enormous success as the chorus soloist in 1940. Thanks to a government grant, Christoff left in May 1942 for Italy where he was tutored for two years in the core Italian bass repertoire by the great baritone of an earlier generation, Riccardo Stracciari. Plovdiv is the second-largest city in Bulgaria, with a city population of 345,213 as of 2017 and 675,000 in the greater metropolitan area. It is an important economic, transport, cultural, and educational center. There is evidence of habitation in Plovdiv dating back to the 6th millennium BCE, when the first Neolithic settlements were established; it is said to be one of the oldest cities in Europe. The St. Alexander Nevsky Cathedral is a Bulgarian Orthodox cathedral in Sofia, the capital of Bulgaria. Built in Neo-Byzantine style, it serves as the cathedral church of the Patriarch of Bulgaria and it is one of the largest Christian church buildings, as well as one of Sofia's symbols and primary tourist attractions. The St. Alexander Nevsky Cathedral in Sofia occupies an area of 3,170 square metres (34,100 sq ft) and can hold 5,000 people inside. It is one of the largest Eastern Orthodox Cathedrals and church buildings in the world, third-largest Orthodox Cathedral located in Southeast Europe, being surpassed only by two new and not yet fully completed Cathedrals - the Romanian People's Salvation Cathedral in Bucharest and the Church of Saint Sava in Belgrade. From 1931 until 1992 it was the largest finished Orthodox Church in the world, and until year 2000 was the largest finished Orthodox Cathedral. After several guest appearances and recitals in Austria in 1944 and 1945, Christoff returned to Italy in December 1945. He made his operatic debut as Colline in La bohème at Reggio Calabria on 12 March 1946. In following years Christoff appeared in a number of roles at Milan's La Scala, Venice's La Fenice, the Rome Opera, Covent Garden in London, the opera theatres in Naples, Barcelona, Lisbon, Rio de Janeiro, etc. Reggio di Calabria, commonly known as Reggio Calabria(listen) or simply Reggio in Southern Italy, is the largest city and the most populated comune of Calabria, Southern Italy. It is the capital of the Metropolitan City of Reggio Calabria and the seat of the Regional Council of Calabria. In 1950 he was invited to sing at the Metropolitan Opera in New York City but was refused entry into the USA as a result of the McCarran Immigration Act, which banned citizens of Eastern bloc countries from entering the country. The role was instead filled by the young Italian basso, Cesare Siepi. After the restrictions were loosened, Christoff made an operatic debut in the United States in 1956 at the San Francisco Opera. He refused any further invitations to the Metropolitan and never appeared there. After a brief absence from the scene due to brain tumour surgery in 1964, Christoff resumed his career in 1965, though at a much slower pace. In 1967 he was allowed to return to Bulgaria for the first time since 1945, for the funeral of his mother. In the 1970s Christoff on-stage performances were all but frequent. [ clarification needed ] He brought his career to an end with a final concert at the Accademia di Bulgaria in Rome on 22 June 1986. 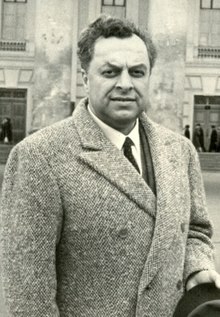 He died in Rome in 1993 and his body was returned to Bulgaria, where he was given a state funeral and buried in Sofia's Alexander Nevsky Cathedral. Christoff had an excellent voice with a distinctive dark tone. Although it was not as large as some other bass voices, he had no trouble making an impact in big auditoria, like the San Francisco Opera. Owing to his stage presence and dramatic temperament, he was a worthy heir to the grand tradition of Slavonic basses exemplified by Fyodor Stravinsky, Lev Sibiriakov, Vladimir Kastorsky, Feodor Chaliapin, Alexander Kipnis and Mark Reizen, among others. He sang mostly in Verdi and the Russian repertoire, and was also a refined performer of vocal chamber music. Among his most famous roles were those of Tsar Boris (Mussorgsky - Boris Godunov ), Philip II (Verdi - Don Carlo ), Mephistopheles (Gounod - Faust and Boito - Mefistofele ), Ivan Susanin (Glinka - A Life for the Tsar ), Zaccaria (Verdi - Nabucco ), Tsar Ivan (Rimsky-Korsakov - Ivan the Terrible ), Dosifei (Mussorgsky - Khovanshchina ), Gomez da Silva (Verdi - Ernani ), Fiesco (Verdi - Simon Boccanegra ), Attila (Verdi - Attila ), Padre Guardiano (Verdi - La forza del destino ), Galitzky and Kontchak (Borodin - Prince Igor ) and others. Fyodor Ignatievich Stravinsky, 20 June [O.S. 8 June] 1843, in Golovintsy, Minsk Governorate – 4 December [O.S. 21 November] 1902) was a Russian bass opera singer and actor of Polish descent. He was the father of Igor Stravinsky and the grandfather of Théodore Strawinsky and Soulima Stravinsky. Alexander Kipnis was a Ukrainian-born operatic bass. Having initially established his artistic reputation in Europe, Kipnis became an American citizen in 1931, following his marriage to an American. He appeared often at the Chicago Opera before making his belated début at the Metropolitan Opera in New York City in 1940. Christoff made studio recordings of eight operas (Don Carlo, Boris Godunov and Faust twice each) and numerous live recordings (radio or stage performances). He was much admired as song singer and he recorded more than 200 Russian songs by Mussorgsky (he was the first to record all his 63 songs), Tchaikovsky, Rimsky-Korsakov, Glinka, Borodin, Cui, Balakirev as well as traditional songs, mostly with piano accompaniment. He initiated the tradition of making studio recordings of Boris Godunov with the same basso singing three roles (Boris, Varlaam, Pimen). He was the brother-in-law of the Italian baritone Tito Gobbi. Many recordings are available. The following list contains just a few. His complete songs by Mussorgsky are available, produced by EMI. He recorded the Verdi Requiem 3 times, once under Tullio Serafin in Rome 1959, once with Herbert von Karajan and once with Bruno Bartoletti. Two recordings of Boris Godunov are available with Christoff singing three roles: Boris, Pimen, and Father Varlaam. Two performances in major Wagner roles are available, both sung in Italian: Gurnemanz in Parsifal conducted in Rome 1950 by Vittorio Gui, and Pogner the goldsmith in Die Meistersinger von Nürnberg , conducted (studio) by Lovro von Matačić in Torino 1962. ↑ Kozinn, Allan (June 29, 1993). "Boris Christoff, Bass, Dies at 79; Esteemed for His Boris Godunov". The New York Times. ↑ Forbes, Elizabeth (29 June 1993). "Obituary: Boris Christoff". The Independent. Livanios, Dimitris (1999). "Conquering the souls: nationalism and Greek guerrilla warfare in Ottoman Macedonia, 1904?1908" (PDF). Byzantine and Modern Greek Studies. 23: 197. , Crampton, R. J. (1997). Eastern Europe in the Twentieth Century-- and After. 2nd edition. London / New York: Routledge. p. 20. A Life for the Tsar , is a "patriotic-heroic tragic opera" in four acts with an epilogue by Mikhail Glinka. During the Soviet era the opera was known under the name Ivan Susanin. Miroslav Čangalović was a Serbian opera and concert singer and is considered to be one of the greatest basses in Yugoslav history. Aleksei (Albert) Dmitryevich Maslennikov was a Russian tenor. Yevgeny Yevgenievich Nesterenko, HSL, PAU, is a Soviet and Russian operatic bass.